Size of this preview: 315 × 599 pixels. Other resolution: 533 × 1,013 pixels. From the 1897 book Eclectic Shorthand by Cross. Scanned by Marlow4 and placed in public domain. It is the Lord's Prayer in English. 15:32, 6 August 2005 . . Kilobytezero (114817 bytes) : I resized the Gregg text to fit the rule of the other systems, which is 34.667 px per line. It seems that no matter how much I conform the Gregg to the geometric systems, Gregg always winds up looking so out of place. 06:33, 6 August 2005 . . Kilobytezero (115609 bytes) : I made and added the Gregg version of this prayer. The original contents are from the 1894 book Eclectic Shorthand by Cross, scanned by Marlow4, and placed in public domain. 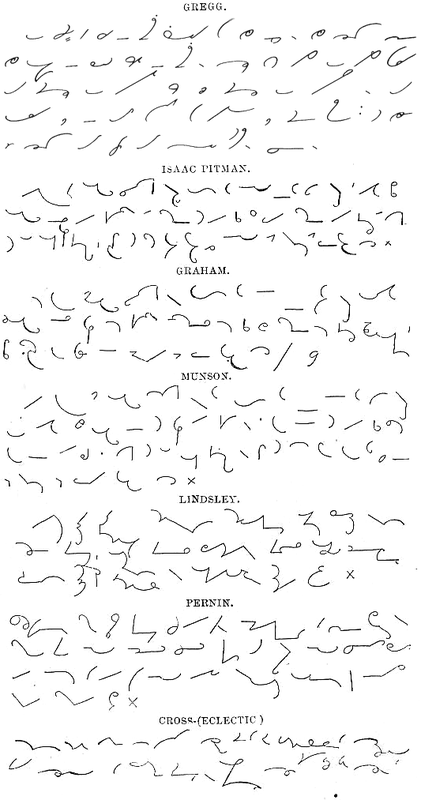 19:15, 12 June 2005 . . Marlow4 (570634 bytes) : From the 1894 book "Eclectic Shorthand" by Cross. Scanned by me and placed in public domain. current 16:04, 19 March 2010 533 × 1,013 (74 KB) AtomCrusher Squeeze!